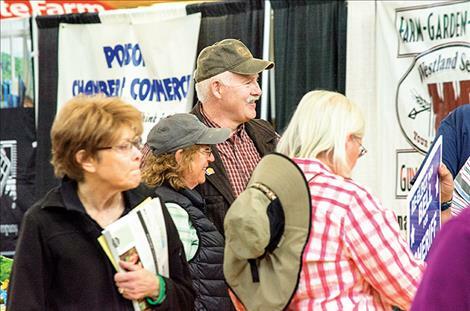 David Coffman talks to people about his run for sheriff during the Mission Valley Spring Trades Show and Business Expo on April 28 at Polson High School. 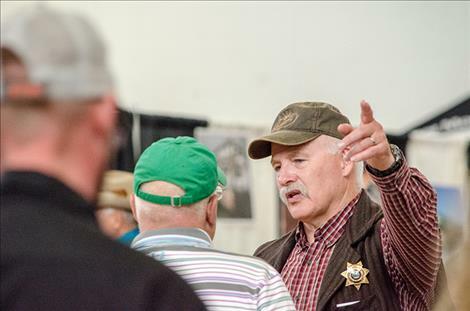 Sheriff Don Bell visits with people at his booth during the event. 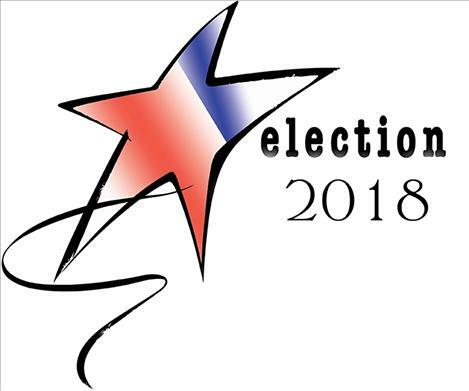 LAKE COUNTY – Two Republicans are currently campaigning for the title of Lake County Sheriff and Coroner in the June 5 Primary Election, and the candidates – David Coffman and Don Bell – separately answered a few questions last week. Where are you from? Incumbent Sheriff Bell is running for a second term. He said he was born in Ronan and raised in this area with almost 26 years of local law enforcement experience with the Confederated Salish and Kootenai Tribal Police Department and the Lake County Sheriff’s Office. 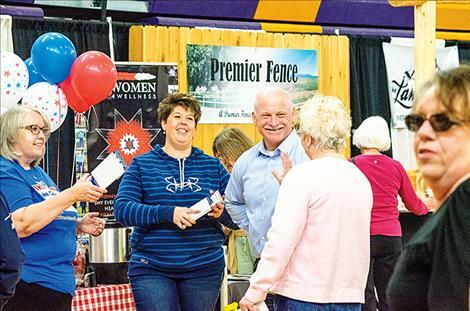 He said he brings local experience to the position along with a connection to the community. Coffman grew up in California and served the Sacramento County Sheriff’s Department for 30 years after being in the Marine Corps. He moved to Polson about two years ago. He said he realizes he is the “outsider” but feels he can bring “fresh eyes” to local problems. Why do you want to be the Lake County Sheriff? Bell answered the question with a look back at the three years he has served in the position already. He said he wants to continue the work he started. What education and training do you have? Bell said he earned an associate’s degree in computer science and graduated from the Montana Police Academy. He has 2,000 hours of law enforcement training. Bell attended an FBI leadership program and the National Sheriff’s Institute training program. He was part of the counter terrorism unit for the 2002 Olympic games. He said his continued training has included tactical skills, interrogation, terrorism defense, bio-terrorism, and knowledge of hazardous materials. Coffman’s formal education began with an associate’s degree in social science. His bachelor’s degree is in intelligence and Middle Eastern studies. In addition he’s taken master’s degree courses in strategic leadership. Coffman also graduated from the California Peace Officer’s Basic Training program. He has 3,308 hours of training including hostage negotiation, interview interrogation, Special Weapons Attack Team (SWAT), narcotics tactics, canine deployment, weapons of mass destruction, officer involved shootings, jail operations, incident command, and cultural diversity. He has been involved in survival training for tactical operations and stress physiology for peace officers. He was promoted to different positions during his time at the department including SWAT team sergeant, watch commander in the jail, and as the internal affairs investigator. Explain your experience with budgets. Bell believes in being “frugal” with taxpayer dollars. He likes to trade in extra vehicles to save money. Tactics such as this, he said, have helped him balance the budget. “The budget has been balanced all the years I’ve been the sheriff, and I’ve built up a reserve of almost $500,000,” he said. Coffman said his experience with law enforcement budgets comes from being the assistant commander at the Sacramento Sheriff’s Department. He said he believes funding should be allocated to areas that reflect the priorities of the community. He added that his style would be to explain to the public why a service is being cut if it needs to be and when it will be returned. What are the problems you want to tackle in the county? Bell wants to continue to work on reducing the “drug epidemic” in the county, increase jail space, and provide continued training for his staff. He said he is constantly working on the drug problem with a focus on “busting people in possession” of illegal drugs and taking those drugs out of circulation. He recently assigned a second detective to the Drug Task Force team to help with the problem. He said he wants his staff to have continued training on a regular basis, and active shooter training is something that is important to him, especially for school situations. More jail space is also on his list of priorities. He created the detention center overflow log so people can see how many non-violent offenders are released from jail due to a lack of space (about 60 people every three weeks). He said he has visited many jails and decided a pie shaped design would be the most efficient, but funding for the project is the challenge. He said talks have been happening concerning the issue with Montana senators and representatives. “I hope they can find middle ground in cooperation with the tribe to get something built, along with a treatment center,” he said. Coffman also wants to focus on the drug problem in the county and work on increasing the jail space. He said grants should be available to get a new jail built, and tax increases, mitigated by federal tax reductions, could help with funding. He added, criminals are learning they won’t be punished if there isn’t space in the jail. Coffman had a similar sentiment: “I’m a Second Amendment advocate,” he said. He believes people should be responsible and safe with guns and get training. He said people should be able to apply for a concealed weapon permit if they don’t have a criminal history, are safe, and comfortable with a gun.